I had to travel far and wide (about 5,000 blocks from my base) to find a jungle, and now I'm not sure how to get the parrots I found back home. I'm pretty sure I could take them one by one in a boat, but that would take forever. They don't seem to follow me over water. Anybody have a tried and tested way to transport them? Sounds like they might move like Tamed Wolves /Dogs. Which seem to go around 75 Blocks between re-Beaching's, when Boating-around, in-and-out of Water. Wouldn't be surprised they're Land-centric (in their Teleporting, even) Animals. In a way, it's easier to hunt Endermen (which at least reliably Teleport, to attack oneself). When Leads - and maybe not-even Boats - don't work, it's a good thing they Do Teleport, though so go ahead and Test how that works from you. As for the Nether, it doesn't hurt to go-through the route first, to make sure it works (and think of other Mobs as taking-up more-room and /or moving-around randomly /Wandering, in any case, anywhere). Walking through a prepared nether tunnel with the animals on leads is my preffered method. I've had several sitting in an open fronted shed for several IRL months without issue at a base I visit occasionally. 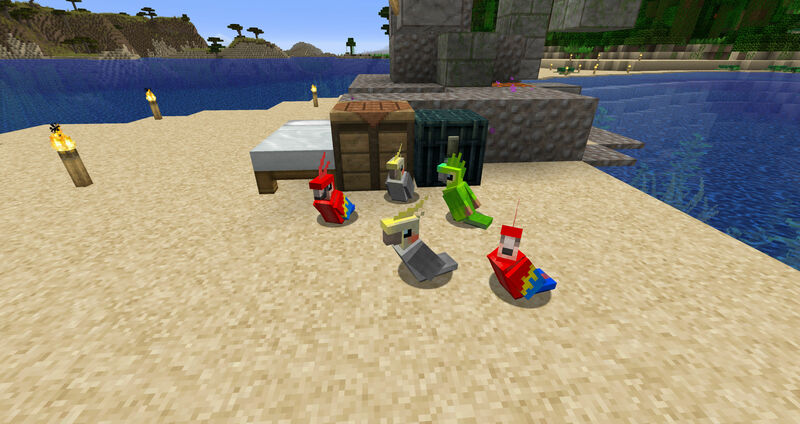 At present there is no wholly reliable way to keep mobs from glitching into/through walls if they are free to move; parrots ought not be any more susceptible to this than other mobs, but they are harder to obtain.